As a bit of a change, I thought I would add some history to an extra entry for today – as were passing through the tunnel and past Husbands Bosworth.. and yes.. whilst this is well before the canal existed.. where would we be without our history to look back and learn from! 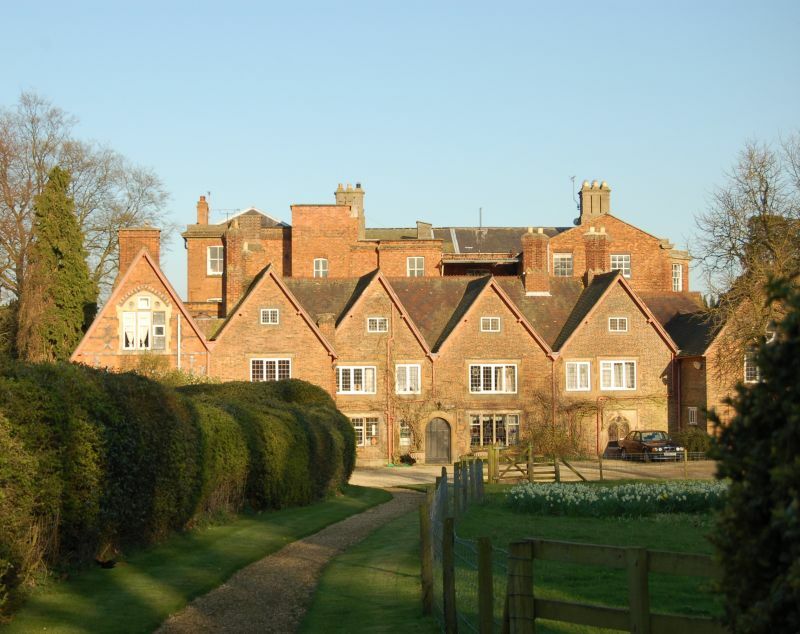 On the 18th of July 1616 (a few months after Shakespear’s death that same year) the now owner of Husbands Bosworth hall (above – now a hotel!) – Roger Smythe (Smith), had 9 of his servant women and girls hanged for alleged witchcraft after his son “Edward” was reported as being “mad” – the cause of which was said to be the female servants bewitching him. They were said to use “familiar” spirits or “imps” in the form of a horse, dog, cat, fullemer (stoat or weasel), fish and code (toad?). When these “tormented” Edward he used to make the noise of the animal concerned. The nine servants were arrested and brought before Sir Humphrey Winch at Leicester Assizes. When Edward appeared he started having fits and making animal noises which startled the onlookers. On his evidence the women were found guilty, taken out and hung. Burning witches was only when they had committed the two crimes reserved in medieval times for burning – the killing of one’s spouse or an act of heresy. 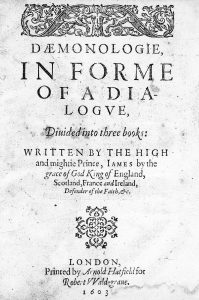 As later detailed in the letter of the 15th of October, a month after the execution of the first 9 “witches”, King James I visited Leicester in the course of a royal progress. He remained there only a single day (arriving on August 15th and leaving the town on the 16th). 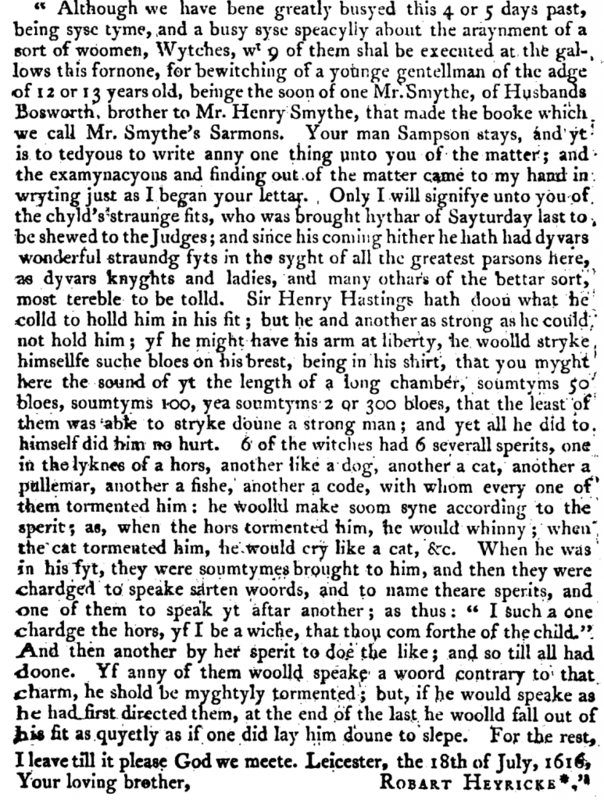 But he found leisure for a humane and enlightened act – Young Smith still having his fits – and finding six more witches were in prison awaiting the autumn assizes. James had long been sceptical about such matters, and he prided himself on exposing sham demoniacs and other impostors. He called the boy before him and soon detected the fraud. But there was not time to sift the matter to the bottom. Accordingly, the king sent young Smith to Archbishop Abbot at Lambeth for further examination, with the result that he made a full confession of his tricks. Abbot then sent the boy to the king, before whom he made a complete exhibition of his imposture. Accordingly, on or about October 15, 1616, by a writ to the High Sheriff of Leicestershire, the five witches still in custody were released without a trial-the sixth had died in the meantime. 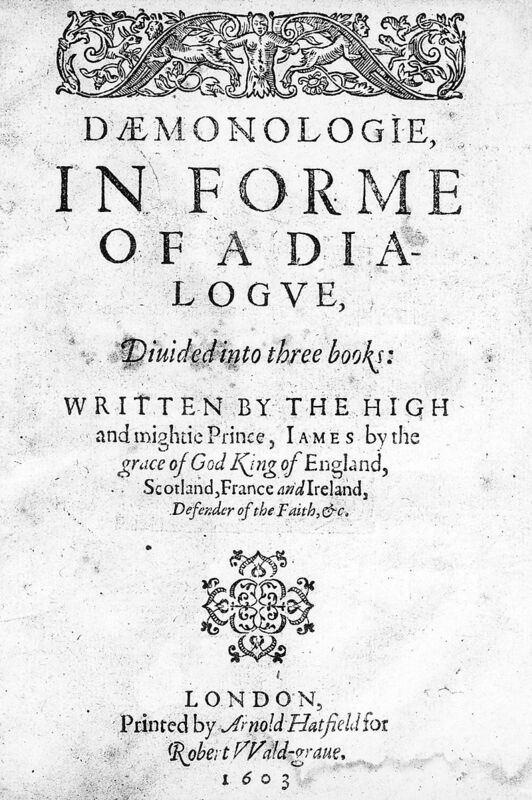 Now whilst these events did take place after the publication of DÆmonologie – written and published in 1597 by King James VI of Scotland (later to be James I of England) – also believed to be one of the main sources for MacBeth, we do know that King James did touch on such subjects as Witches, Werewolves and Vampires.. and was also satisfied to expose shams and impostors whilst on a constant quest to prove the existence of Witchcraft..
A very interesting story to a page of history, that may well have been a miscarriage of justice But despite that in those days back in history they did not mess about justice was harsh its a great pity it’s not that hard these days with what we have to tolerate by the crime reports and records but instead the criminals get a pat on the head and are encouraged to commit further crime with the law being so bloody soft.